As you explore the world for weeks or even months at a time, a reliable source of electricity is essential for mobile independence. A made-to-measure power system provides you with a complete system to achieve this, with the Lithium Ion batteries as its heart, that can easily supply all AC consumers. Even when you use a lot of electricity, or require air conditioning, sensitive electronic equipment or internet access... The choice is yours! The goal is to have complete luxury and comfort for as long as possible. You charge your batteries with heavy alternators on the main engine while driving, so seldom need grid power. The additional Alpha 24/75 alternator will charge the batteries while driving/running your engine. This 24 volt 75 amps alternator is designed to provide maximum output, even at low engine speed (rpm). You will be able to charge roughly 24 x 75 = 1.8 kWh every hour the engine is running. This alternator gives you full independence! Lithium Ion batteries have a high energy density and are perfect for cyclic applications. They offer savings of up to 70 % in volume and weight, with three times as many charging cycles (2000 full cycles). The Lithium Ion Ultra series includes integrated battery monitoring. 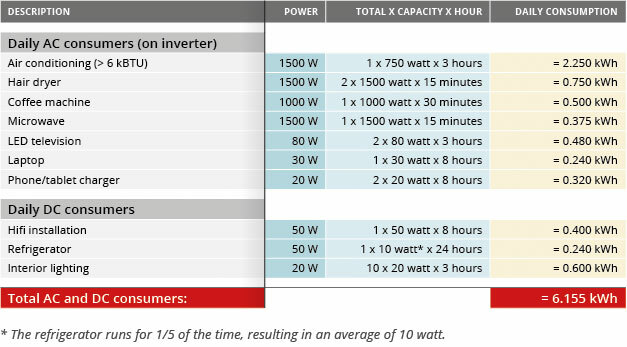 The total of AC and DC consumers requires around 6 kWh. For two days of independency without running the engine you need 12 kWh. Totally discharging the batteries is not advisable so opt for a maximum of 80 % discharge for Lithium Ion batteries, i.e. they should provide at least 13.3 kWh. A battery voltage of 24 V is selected to allow for smaller cable sizes. The required battery capacity is around 450 Ah. Three Lithium Ion batteries provide 540 Ah onboard. 3 x safety relay 500 A (mandatory). 3 x fuse holder plus 3 x Class T fuse 225 A. In this case, 625 Ah needs 15 % of the battery capacity for charging power, so we chose for 100 A charging power via the Mass Combi Ultra. The Combi Ultra has a battery charger that allows you to safely, quickly and completely charge two battery banks; starter and service batteries can be separately charged. Additionally the Mass Combi Ultra can be used to convert the power for your AC applications, so using everything simultaneously is also possible. The products in this system communicate with each other via MasterBus. This bril­liantly simple platform for communication and connections ensures that all components ‘speak’ the same language. The result is a single communication protocol with high-speed CANbus technology. 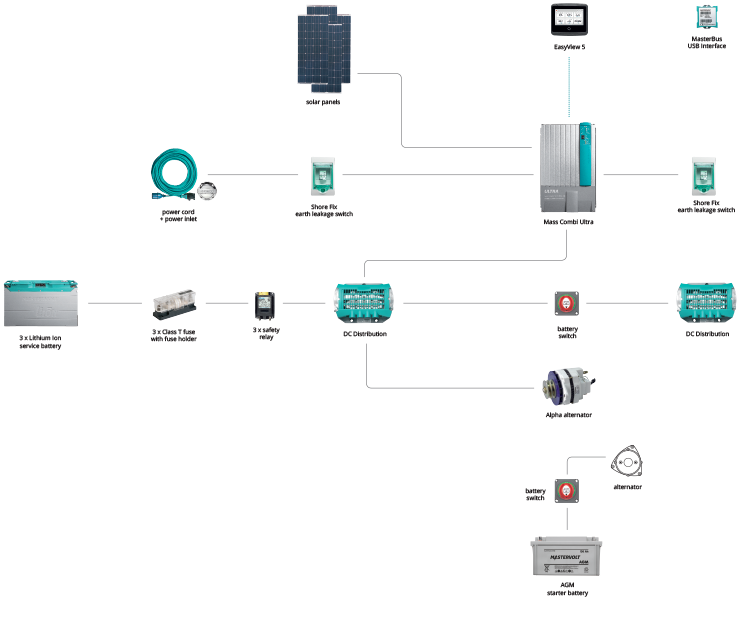 This distribution model connects up to four DC devices to the DC groups, such as a Combi, inverter, alternator and solar panels. 1 x Solar ChargeMaster; provides a pure charge current in all conditions while the 3-step charging method ensures a safe charging process and a longer lifespan for your batteries. 2 x Shore Fix, 16A/30mA earth leakage switches.